New Year’s Resolutions… or life long ambitions? This year, as I teeter on the edge of 40 and ponder what 2011 may hold, I’ve decided to rethink my resolutions. I’ve decided that since there’s an undeniable pattern in my annual goals (exercise more, save more money, find time for date nights! ), why limit them to a calendar year? 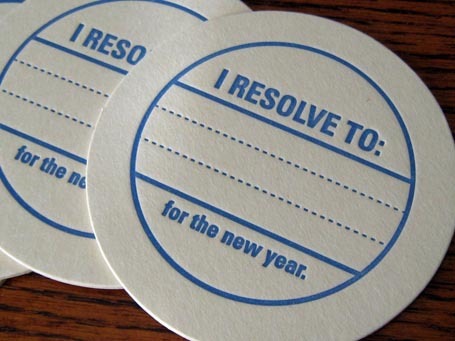 Why not think of resolutions as long-term ambitions? Maybe it’s a cop out. Maybe I’m letting myself off the hook by lifting the 12.31.11 deadline but, on the other hand, maybe I’m giving myself the chance to truly be a better person and lead a better life. It is with this hope, intention and optimism in mind that I share with you my goals for 2011… and beyond. I’d like to be more present and less distracted. To live in the moment. To savor the moment. To recognize that it’s not always necessary (or productive!) to fold the laundry while helping with homework and assisting with puzzles and Lego creations. To realize that the homework, puzzles and Legos matter far more than neatly folded towels! To remember that multi-tasking has its limits and ultimately, gets in the way of really listening, being present and living in the moment. I’d like to be more grateful for what I do have rather than longing for what I do not. I’d like to truly appreciate the little things that matter and stop yearning for the big things that don’t. I’d like to start each day with a smile and end it the same way. I’d like to be a better wife and more patient parent. I’d like to instill my children with a sense of confidence in themselves and respect for others. I’d like to set a good example – something I’m not always prone to do, especially toward the end of the day when I’m as tired and hungry as my five little “Cubs”; I’ve been known to try to outshout them just to be heard and trust me, this doesn’t work. Not to mention, it does nothing for your esteem to know that you’ve stooped to the level of a pre-schooler! Come to think of it, perhaps I’m resolving to simply stop acting like the many pre-schoolers who inhabit our home. All I need to do is be a better listener, focus on the task at hand and take time to appreciate (rather than sweat!) the small stuff… including, for example, all the arts & crafts projects our little Cubs create. If I’m lucky, this year’s projects will include a few nice birthday cards wishing me a Happy 40th and I’ll be perfectly happy with just that. Although, of course, the party and weekend away would be nice too!